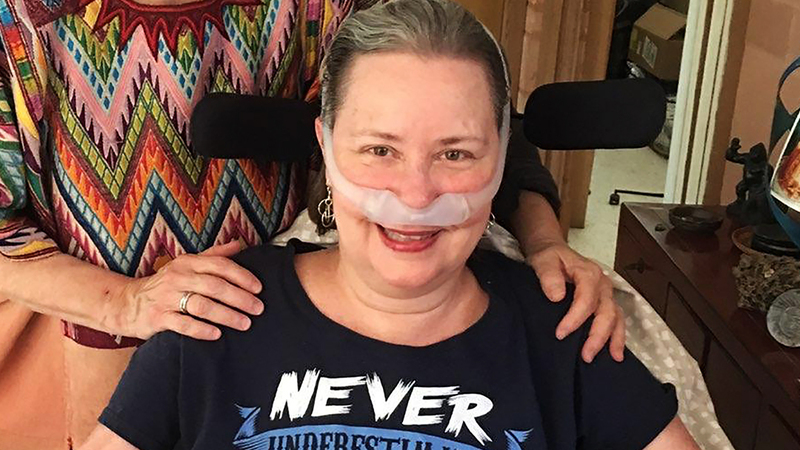 Sandra Murphy-Pak knows she may never benefit from research aimed at helping ALS patients lead more independent lives, but her reason for participating in research studies has always been about others. Sandra Murphy-Pak is not taking amyotrophic lateral sclerosis, or ALS, lying down. Far from it, in fact. As we noted this past January, she's not letting the disease stand in the way of her life as an artist. She's also helping to create "better therapies, if not a cure, for those diagnosed with ALS in the future" by continually donating tissue and blood samples to Mayo Clinic so that researchers can continue their search for answers. As the Florida Times-Union reports, Sandra's also been helping Mayo researchers and her fellow ALS patients in another way: by participating in a clinical trial aimed at letting ALS patients maintain some independence, and personal mobility, for as long as they can. The trial is allowing patients to move a wheelchair using nothing more than the muscles in their face, which as the paper reports, are "typically the ones that can still be used even after other parts of the body can no longer move." Called the "Xavier Project, after the scientific genius in a wheelchair played by Patrick Stewart in the X-Men movies," the trial is a joint effort between Mayo Clinic and Limbitless Solutions, the paper reports. The "nonprofit affiliated with the University of Central Florida" is testing electromyography sensors "placed on the temporalis muscles of Murphy-Pak's head" that can be activated with the use of her jaw muscles. Each flex of those jaw muscles, the paper reports, "creates a tiny bit of voltage that is captured and translated into a device" retrofitted for her wheelchair. While Sandra is encouraged by what the technology has been able to do for her, she also realizes the technology still has a long way to go and that, given the progression of her disease, she might not be able to benefit from it herself. But that hasn't stopped her from participating in the study on three separate occasions, and she tells us it won't stop her from participating a fourth, fifth, or sixth time, either. "As a patient of Mayo's ALS Clinic, I truly believe Mayo Clinic has saved my life and has helped me continue to live a high-quality life, and so participating in clinical research studies like this is my way of helping others and giving back to the institution," Sandra says. "With each new session, I was able to give feedback to the engineers to help them refine the technology. I see the long-term potential of this, and by participating, I hope that it will help others." Neurologist Bjorn Oskarsson, M.D., director of Mayo Clinic's ALS Clinic, tells us that's exactly what Sandra — and the other study participants like her — are doing for researchers. "Our research team is made up of volunteers, scientists and clinicians, and being a volunteer is the most taxing," Dr. Oskarsson says. "Without our volunteers we would be unable to develop new treatments, and this type of wheelchair controller has tremendous potential both for ALS patients as well as for other disorders where people choose to use these types of devices to maintain their independence. And if one tries to imagine oneself in Sandra's situation, I think one can understand just how important the development of this type of technology truly is." You can read more here. Then let us know what you think by sharing your comments below. You can use the handy social media tools atop this page to share this story with others.